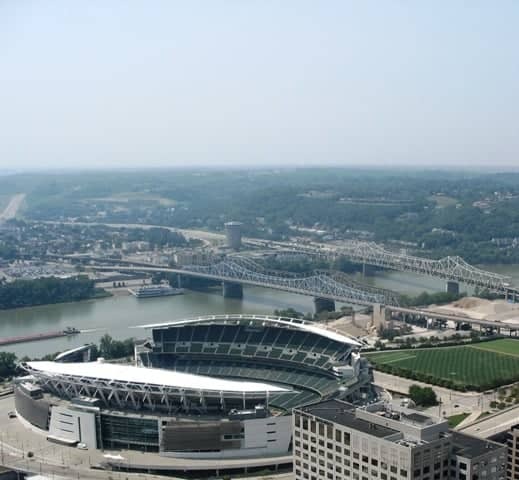 The Carew Tower has been a Cincinnati skyline landmark since the 1930’s and it is still as beautiful as ever! 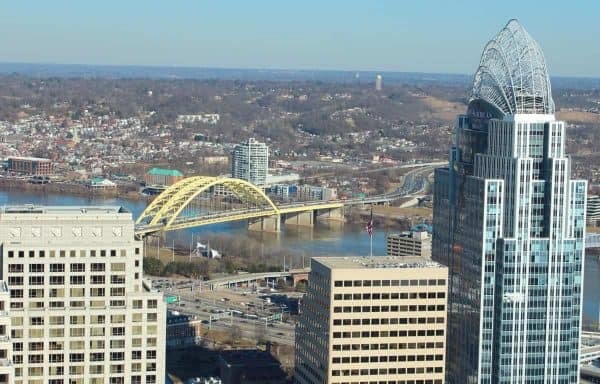 Go exploring downtown- take the elevators to the top of the Carew Tower and enjoy the panoramic views of Cincinnati from the Observation Deck. The Carew Tower has 23 elevators and stands at 49 stories tall. It was the first office building downtown to have an unmanned elevator operated by push buttons. 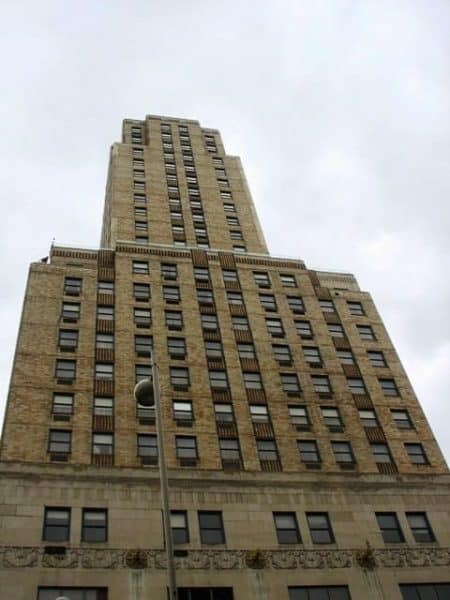 Architect William Lamb designed the Carew Tower and it’s said that he then went on to model another building after it – The Empire State Building. 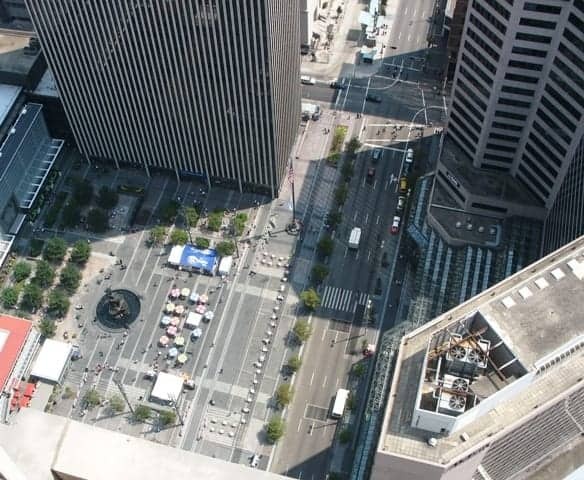 The Carew Tower is the now the second tallest building in Cincinnati but it held the title as Cincinnati’s tallest building for years. 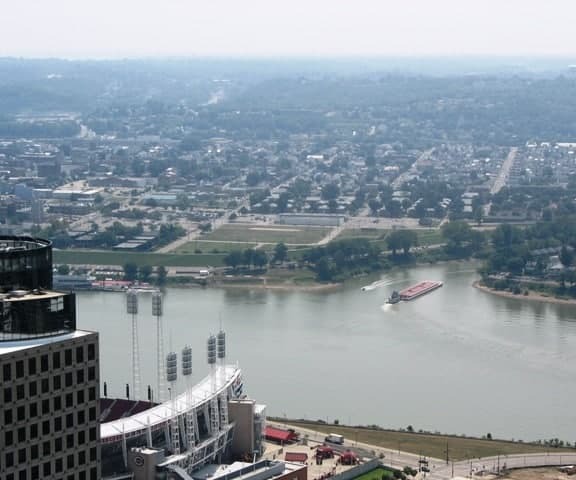 Hop on one of the many elevators and enjoy the panoramic view of Cincinnati that only the Carew Tower can provide! 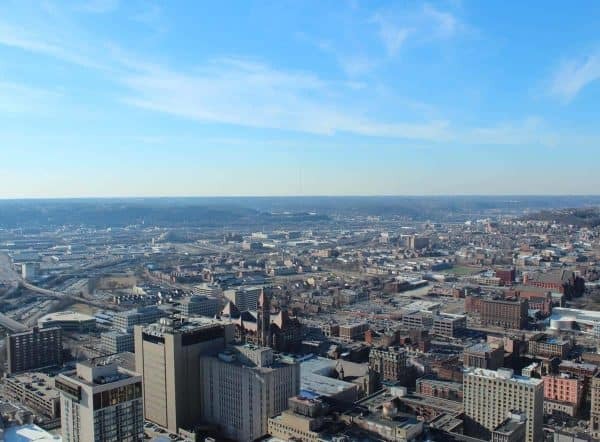 Ride up to the 45th floor and then change elevators for the last few floors (or climb a few stairs) and you’ll find yourself on top of the Carew Tower at the observation deck. to Paul Brown Stadium (and nearby practice field) trimmed by the bridges. Look up the river and you’ll see Mt. 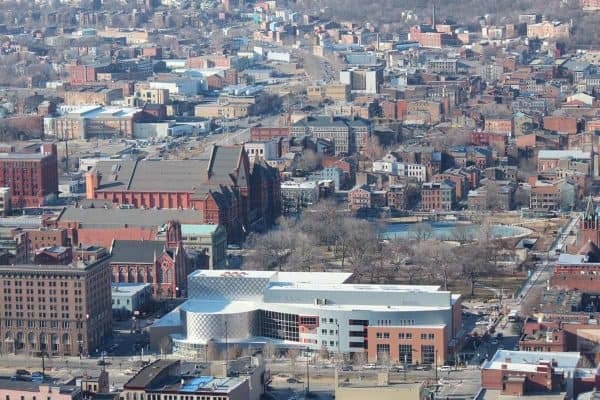 Adams with its own skyline landmark, Holy Cross – Immaculata Church (just left of center in the pic). Construction of the Great American Tower unseated the Carew Tower and is now Cincinnati’s tallest building. 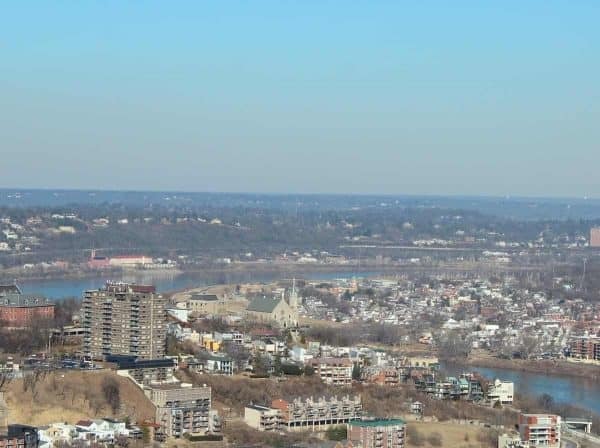 But I would venture to say it will never win the hearts of Cincinnatians like the Carew Tower has. $6 for adults, children 6-11 are $3, and children 5 and under are free. The not so Great American Tower – the ugliest building ever built in the United States – perfect for ‘Cincy’! Love this building! Mosaic tile and gold leaf ceilings. It’s a lot to take in for those who appreciate history. Orchid Restaurant is not to be missed for Holiday buffets. 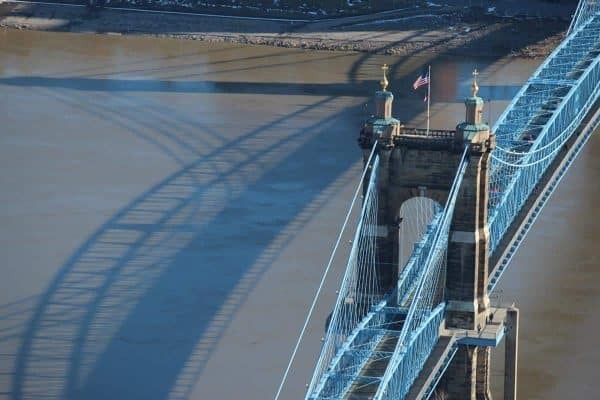 The views are the best Cincy has to offer. Enjoy! I have the Orchids buffet on my list of things to try. I’ve heard great things about their buffet. Thanks for the tip, Marisa :). Orchids for dinner is not to be missed either . . . such a wonderful experience! The Monastery at the very top of Mt. Adams is the skyline landmark of Mt. Adams rather than Immaculata. As an out-of-towner, parking is always a consideration. 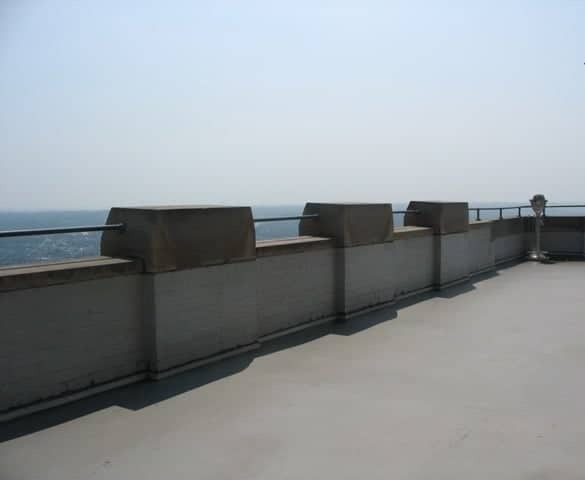 Where can I park when visiting Carew tower?